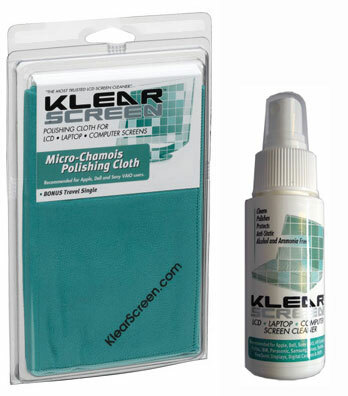 Klear Screen cleans your iPhone screens, Laptops, Cameras without leaving marks- it gives a clear clean finish after polishing off all the solution with your polishing cloth. There is no alcohol in Klear Screen so polishing off the solution gives a clear finish. One (1) 60ml Klear Screen non-aerosol pump spray bottle provides approx 300 applications. This new microfibre polishing cloth provides an unequalled polishing performance. This lint free, non damaging, optical grade, washable and reusable cloth in combination with Klear Screen safely cleans and protects the coating on the screens all your electronic displays, LCD screens -laptops, desktops, glossy screens HDTVs, Plasma screen TVs, CDs & DVDs and more. Highly recommended for all iPhones Apple MacBooks, MacBook Pro, PowerBooks, iBooks, iMac, Cinema and Studio displays, Dell Monitors and Laptops, Laptops and Desktops, Sony Displays including those with XBRITE and glossy screens,, High Resolution Trinitron CRT and all new computer screens.